NEW YORK, NY--(Marketwired - June 25, 2015) - Nuxeo, provider of the Nuxeo Platform, a highly customizable and extensible content management platform for building business applications, announced the availability of Nuxeo Platform Fast Track (FT) 7.3. This latest release provides several new capabilities including integration with cloud file sharing platforms, secure Elasticsearch queries with built-in permission checks, better branch management and new options to store files locally or in the cloud. Nuxeo Platform FT 7.3 includes Live Connect which allows the Nuxeo Platform to treat files in various cloud-based file sync and share systems as if they were part of the local file system or repository. This allows organizations to take advantage of the collaboration features of Enterprise Files Share and Sync (EFSS) platforms and the business benefits of the Nuxeo Platform. By integrating assets residing in a EFSS platform with Nuxeo's fluid, agile workflow system, the business value of the assets is multiplied, adding context to data in relation to company processes and daily tasks, informing decision-making, and driving more productive business operations. "Even though EFSS revolutionized the way people work together, adding this benefit to your business processes has required a copy and paste approach or, at best, upload them to your ECM. The business part, the information part hasn't reacted. We are changing that," said Eric Barroca, CEO of Nuxeo. "With Nuxeo Live Connect, it's time to revolutionize the way organizations use content to benefit their business." 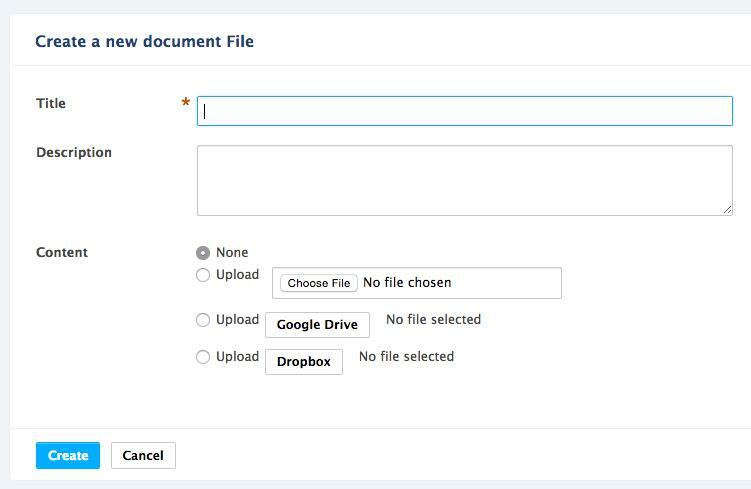 Nuxeo Live Connect - This innovative new feature provides native integration with Cloud-Based Enterprise File Sync and Share (EFSS) platforms -- Nuxeo has added native support to natively connect to files stored in EFSS systems including Google Drive and Dropbox. This allows Nuxeo customers to benefit from the collaboration and files sharing capabilities of EFSS platforms and the metadata and business processes capabilities of the Nuxeo Platform. Editors on these platforms, e.g. 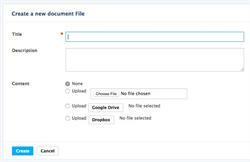 Google Docs, Slides, and Sheets, can be viewed and accessed within the Nuxeo environment, providing free and open collaboration without having to copy files and store them locally. With this release, Nuxeo customers can not only access the standard editors on these platforms but also the wealth of third party editors that have been created. Two or more users can collaborate on a given file - for example, a legal contract or a press release being readied for distribution - within the Nuxeo environment or outside of it while maintaining the approval workflow and publishing capabilities. In this manner, a wide variety of business processes can be integrated with the sharing and file storage capabilities of the EFSS platform and made more efficient through intelligent automation. Elasticsearch Query API with Automatic, Dynamic Security Filtering -- Developers can now use a new Elasticsearch API to query the Nuxeo repository, and build custom Elasticsearch front-end applications, with no need to worry about user authentication or permissioning, which are now automatically enforced by the Nuxeo Platform. Branch Management and Collaborative Configuration with Nuxeo Studio -- Nuxeo users can create and manage branches of their Nuxeo Studio Projects. This allows developers to collaborate while building applications by configuration. Development time can be accelerated and Nuxeo developers can easily use Nuxeo Studio in their development workflow and integration tools. Cloud Media Publishing -- Nuxeo customers now have an easy way to push digital media, managed by the Nuxeo Platform, to video publishing platforms. 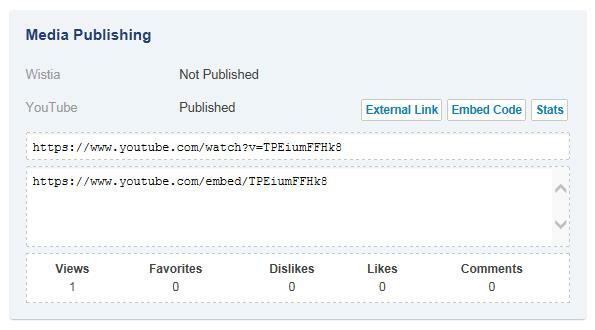 The 7.3 release introduces the ability to publish videos directly to YouTube and Wistia out of the box with the ability to easily add other providers. Once the video is published, users can retrieve URLs, embed an HTML snippet to publish on an external website, and view analytics directly from the video platform inside of Nuxeo. Hierarchical Storage Management (HSM) -- Nuxeo developers can now implement a HSM policy that complies with business rules while also improving application performance and storage cost efficiencies. The new File Storage Dispatcher enables developers to specify which BLOBs are to be stored in Amazon Simple Storage Services (S3), locally, or on a different on-premises storage system. This can be determined based on multiple criteria, including document metadata, file path, file type, or as specified within written code.